Alan Eagleson: [to Phil Esposito] Look, you played under Hull's shadow in Chicago and Bobby's in Boston. Alright? Okay? This is your big chance kid, to show everybody, that you're just not another second banana. One of the great moments of Canadian sport came when I was in an Ottawa tavern in Sept. 1972 and Paul Henderson scored the winning goal against Russia to redeem Canadian hockey. Everyone in that room let out a burst of joy and relief when that goal came. No one who saw it on the grainy film that came out of Moscow will ever forget it. 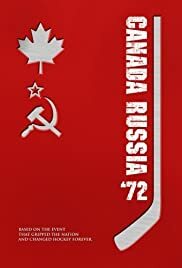 A movie can never recapture that moment but I still couldn't tear myself away from the TV when Canada-Russia '72 movie was shown. It brought it all back. Gabriel Hogan as Ken Dryden gives a good portrayal of Mr. Goalie, who had his own ups and downs in the series. Other actors brought a ring of truth to Phil Esposito and Coach Harry Sinden. Esposito was the leader (with all his warts) and Sinden was head and shoulders above the other guys behind the bench. I liked Sonia Laplante in the role of a Canadian diplomatic liaison, trying to walk a tightrope and juggle at the same time. She had to keep them on their best behaviour and at one point, she negotiated the release of a fan stunned and shaken after the Russian authorities arrested him for blowing a horn during the game. The movie gives depth to what the team was enduring behind the scenes as the national fever mounted during the series. We see their stupidities and their hotel pranks, which made them look like a bunch of bozos until they settled down. The Russians were not blameless and the arrest and humiliation of one Canadian fan was news to me. Was this historical fiction or was it true? Only the players know how accurate this is. Nevertheless, it is true that the team and all of Canada was in shock after the first game. It should not have been surprising that a group of individualists would not automatically blend into a unit off the bat. We were so naive in our assumptions. With hindsight we see how mistaken the herd instinct can be. This comes through loud and clear in the movie. I take issue with Canadians not supporting the team. Certainly everyone was cheering them on, despite the disappointments. If it had been a walkover, there would be no drama and Canadians got involved because our international reputation was on the line. Before the series went back to Russia, Canada was down. Along with millions of others I sent postcards of support; in my case, one to Sinden and one to Esposito. Win or lose, I was with them and so were millions of other Canadians who wanted them to win and so they did...in dramatic fashion.